Slideways Go Karting Australia | Origin Madness Returns to Slideways Go Karting Brisbane! 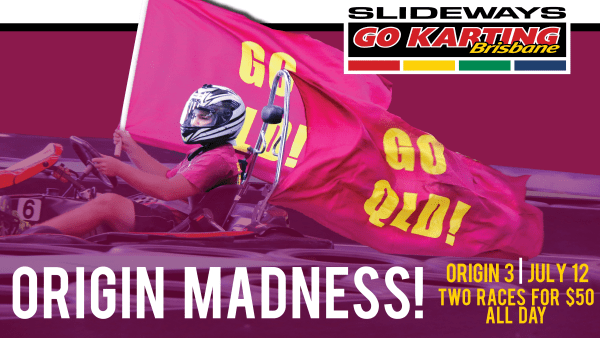 Origin Madness Returns to Slideways Go Karting Brisbane! Home News and updates Origin Madness Returns to Slideways Go Karting Brisbane! State of Origin fever hits Slideways Go Karting Brisbane at Eagle Farm on Origin Game 3 day, Wednesday July 12, with two 10 minute races available for only $50! Simply mention this promotion at the check in counter, and you’re on your way! The offer represents a $16 saving over the regular two race pricing, is available only at Slideways Go Karting Brisbane, with all sessions purchased to be used on the day. Standard Slideways membership requirements apply. Be one of the first to try out the all-new 425m indoor drift circuit, which features two massive second level structures, as well as an outdoor loop. The track is longer, has more massive ramps, is faster and flows perfectly, meaning you can link together the entire circuit drift style with your mates. Why not make a day of it? A spot of Slideways before heading off to the Cauldron! Up the mighty Maroons! Click here for our event on Facebook to stay up to date with the latest news!